Expanding on the topic of a previous blog, this post compares statistics on the number of women in national parliaments in the South Caucasus and other areas of the world. The countries of the South Caucasus rank low on women’s participation in parliament compared to many other countries. Introducing quota systems has shown some success in certain countries as it has led to an increase in the number of women in parliament. Yet, such quotas require careful consideration of local resources and cultural factors. According to a recent article in the Economist, women currently hold almost 20% of the world’s parliamentary seats—up from 17.2% in 2007. The Economist provides the following chart based on data from the Inter-Parliamentary Union. As the chart shows, Rwanda, Sweden and South Africa are leaders in terms of the percentage of women in parliament (well above the world average of about 20%). 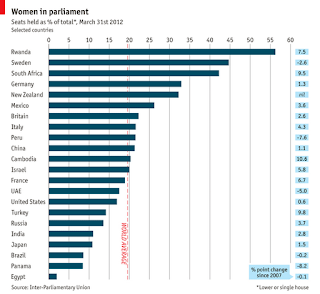 Brazil, Panama and Egypt have the lowest percentages of women in parliament on the chart, with Egypt having less than 2% women in its parliament. A more comprehensive list of countries can be found here. How do Georgia, Armenia and Armenia rank? With 6% of women in its parliament Georgia stands between Egypt and Panama. Compared to Georgia, Armenia and Azerbaijan have a higher share of women in their parliaments – 9% and 16%, respectively. However, all the three countries of the South Caucasus are well below many European countries—especially the Nordic countries which have the highest percentages of women in parliament (the average is 42%). Should the South Caucasus follow the example of several other countries and set a quota system? And to be more critical - Are women in the South Caucasus willing and ready to occupy 20% or more of parliamentary seats?